What Is DD Form 1348-5? 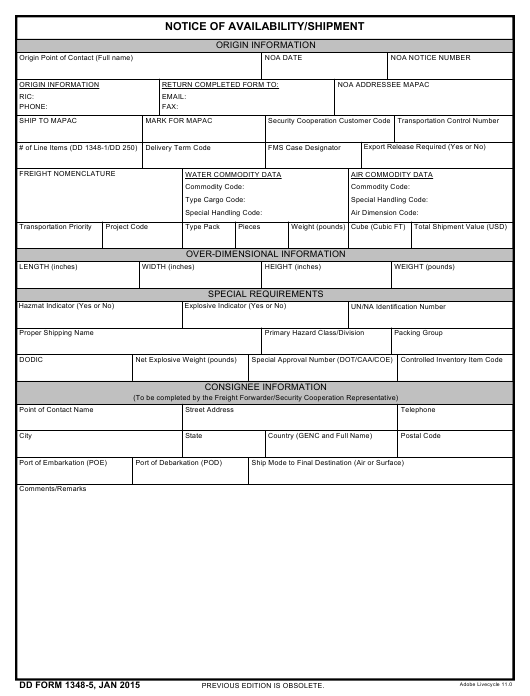 DD Form 1348-5, Notice of Availability/Shipment - or NOA - is a form used by a shipping activity to inform the CR or FF that the material is ready for shipment. The NOA is used as a cover document for separate copies of the DD Form 1348-1A, Issue Release/Receipt Document. The NOA describes the shipment unit while the individual DD 1348-1A Forms provide data about the specific items within the shipment. The set of forms notifies the designated FMS freight forwarder that the material is ready for dispatch and indicates the need for export release when it is appropriate. The DD Form 1348-5 - sometimes incorrectly referred to as the DA Form 1348-5 - was last revised by the Department of Defense (DoD) in January 2015. A fillable DD Form 1348-5 version is available for download and digital filing below or can be found on the Executive Services Directorate website. The DD 1348-5 form is a three-part carbonless document of pin-feed, tear-away paper. It accommodates 10 printed characters per inch and may be prepared manually or digitally. For all classified shipments and some unclassified shipments for all countries, the paper is prepared manually by default. The legal representative will need to submit a corresponding request to the Director of the Defense Logistics Agency in case a mechanized Notice of Availability is required. The NOA has an assigned number that is - at the same time - the control number of the shipment. In case the TCN is not assigned (e.g. when the dispatch is made on a commercial bill of lading), the shipping activity assigns its own FMS notice number. The filing of the NOA is mostly self-explanatory. The date when the paper is sent should be entered in the 'Notice of Availability/Shipment' block. The 'Notice Number' block is intended for the TCN or GBL assigned to the dispatch. In case the data that describes the type pack, weight, pieces, and cube is already specified in the DD 1348-1A, it can be omitted in the DD 1348-5. The fully completed manually-filed Notice of Availability is mailed to the FF or CR indicated in the MAPAD.